'Cause if you're born for a quarter, you're never going to be a dime. 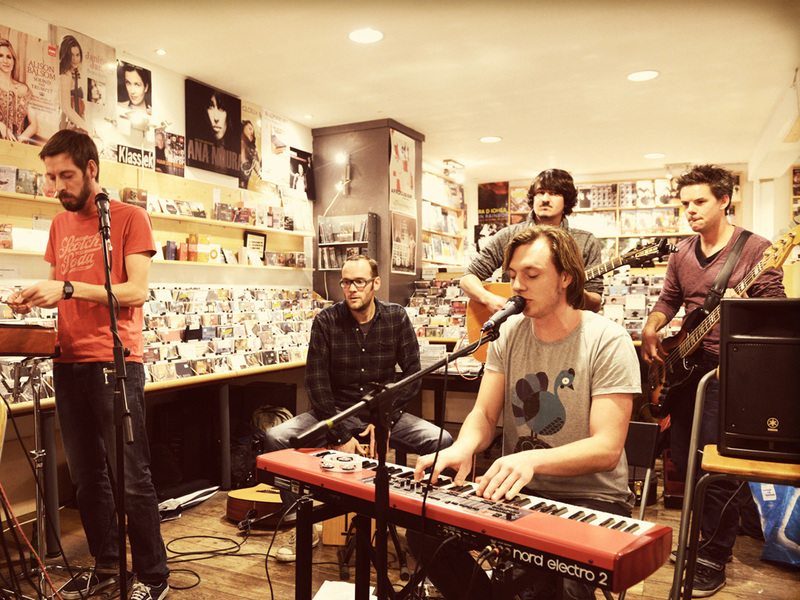 Villeneuf is an indie pop band formed in the Netherlands in 2010 and one of Michiel van Poelgeest's current and most notable music projects to date. The band also consists of Bas Ernst, Ronnie Verton, Lucas Meijers and Rutger Brouwer. The group's collective second album Great Waste of Time was released as a limited edition silk screen and digital album on November 22nd 2012. The name of the band just had to be French. Van Poelgeest independently released Villeneuf's self-titled debut album in 2009, most of which was recorded in his living room, using not much more than a laptop and a usb-microphone. And if it had been up to him, Villeneuf would have never set foot on stage. But it was fellow musician Bas Ernst who inspired and challenged van Poelgeest (during a vacation in France several years ago) to perform his music on stage, instead of solely in his attic. So it was decided: Ernst joined the band (as a drummer), as did guitarists Meijers and Verton and bass player Brittijn. These musicians were no strangers to lead singer van Poelgeest: he had been playing with most of them as a pianist and backing vocalist in another band: Junior Eats Alone. In October of 2012 bassplayer Alex Brittijn left the group. The vacancy was quickly filled by Rutger Brouwer. "Thanks so much for wasting your time on Villeneuf. Here's a little story about the album. Great Waste Of Time was released on November the 22nd of 2012. It is composed of 11 tracks that were recorded, mixed and mastered over a period of three years time. The recording took place in various locations, using different equipment and coping with changing conditions and moods every time. A dangerous game as opposed to the more common method of locking oneself up in a studio for two weeks and coming out with an album that sounds as if it was meant to be an album. But hey, who are we to judge ourselves? Some songs on 'Great Waste Of Time' were composed months ago, others may have been conceived four or five years ago. A side effect of the independent status of Villeneuf. The bright side of it all is that the album now has one of the most beautiful themes one could imagine: life, and everything in it. There is no CD (for now, at least) for a reason. We wanted to do something special, release something unique. A product you would want to hold, put up on the wall or look at while you're listening to the songs. In doing so, Villeneuf collaborated with artist Julian Sirre and came up with the idea of a silk screen that would have the look and feel of a vinyl album cover, except that it wouldn't contain any vinyl. What you see is...welll...kind of what you get: the beautiful artwork made by Sirre and a bandcamp download code which you can use to easily download the songs (plus extras). Great Waste Of Time is also available through iTunes and Spotify. Last but not least Villeneuf would like to thank you for buying this album! We're all proud of it and hope you'll enjoy listening to it. See you soon, Villeneuf."